Is That A Starfish On My Face? : Krulwich Wonders... Unappointed and spontaneously in their different ways, artists from all over the world are trying to remind us that coral reefs are in trouble and keep us from making things worse. Is That A Starfish On My Face? The problem is we don't see the problem. Because coral reefs sit below the water line, when they start to disintegrate (from pollution, overfishing, climate change, ocean acidification ... the list is long) most of us wouldn't notice. Or — and here's an irony — the more we notice, the more they disintegrate. Some coral reefs are so overvisited, they are harmed by our attention. What to do? Well, this is where the sculptors and weavers come in. That's right, sculptors and weavers. Unappointed, spontaneously in their different ways, artists from all over the world are trying to remind us that reefs are in trouble and keep us from making things worse. They can't solve the fundamental problem (oceans are extraordinarily complex ecosystems), but their ideas are creepily, astonishingly beautiful and clever. 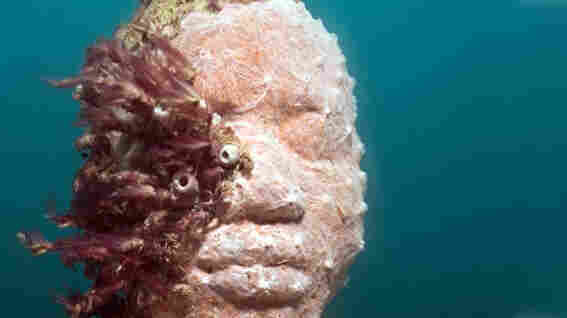 For example, take a look at this man, sculpted from real life by Jason deCaires Taylor. He is made of cement. Not ordinary cement, but a pH-neutral variety, designed to host sponges, tunicates and underwater life. Our oceans teem with microscopic organisms that constantly rain down from the surface. If they can land on a durable, solid, hospitable surface, they will attach, colonize and become sea coral. The problem is most of the sea bottom is soft and sandy. 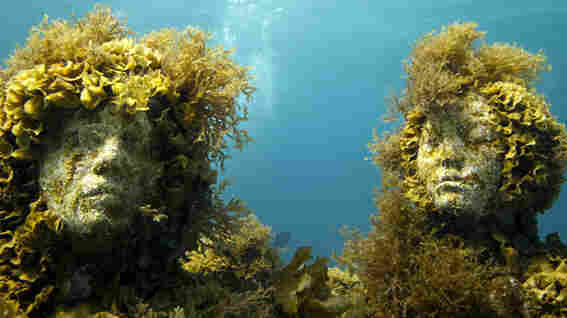 Only about 10 to 15 percent has a substratum solid enough for reefs to form naturally. Jason figured, why not help out a little? A few years ago, off the Caribbean island nation of Grenada (remember Grenada? 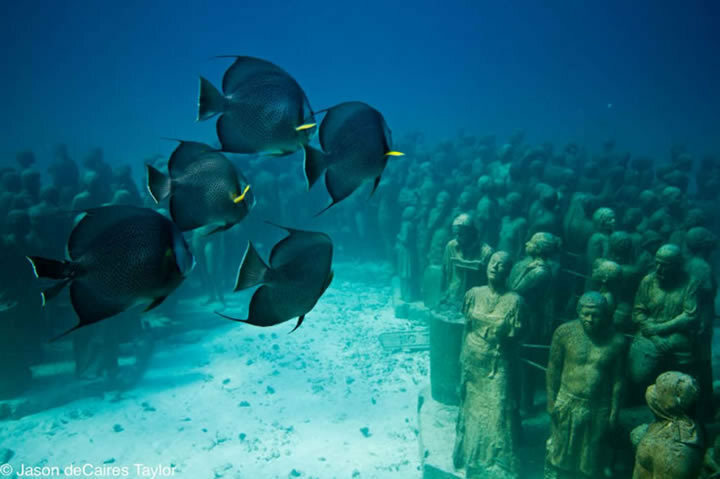 We invaded it a few decades ago), he helped create a small underwater sculpture park by dropping and anchoring groups of statues into circles and odd formations on the shallow sea bottom where they could be easily visited by snorkelers and scuba divers. 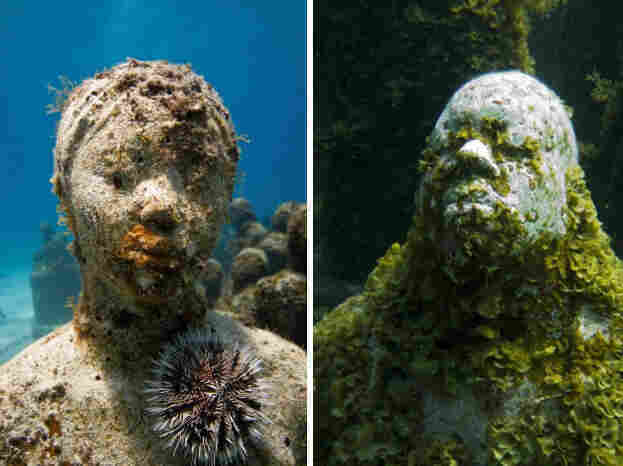 Yes, they can look a little creepy, these human figures gradually getting encrusted. Some of them have holes in them for lobsters. But hey, if you were hanging out at the nearby natural coral, wouldn't you want to swim over and see this? For one thing, water is a magnifier. Objects appear 25 percent larger; light refracts at different rates at different depths, so the sculptures will change appearance depending upon how you approach them. And unlike a museum, you will be floating, not walking through. As Jason told Diver Magazine, "Bouyancy and weightlessness enable a detached physical experience that's perceptual and personal." Kind of like an underwater acid trip, I'm thinking. But the sly part of all this is what the sculptures do for the coral. By pulling visitors away from the natural coral to the new, adjacent "parks," there is less human pressure at the original, fragile sites. 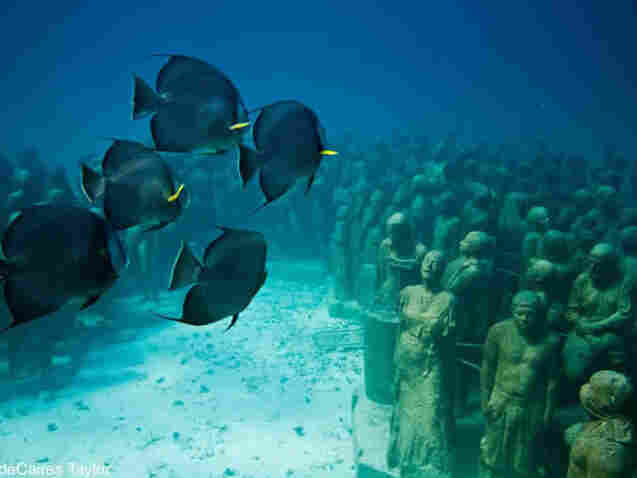 And later as the statues get covered over, they may become hosts to the next generation of coral reefs. Sounds like it might work, unless the parks double the crowds, but the game is on. La Evolucion Silencia by Jason de Caires Taylor. 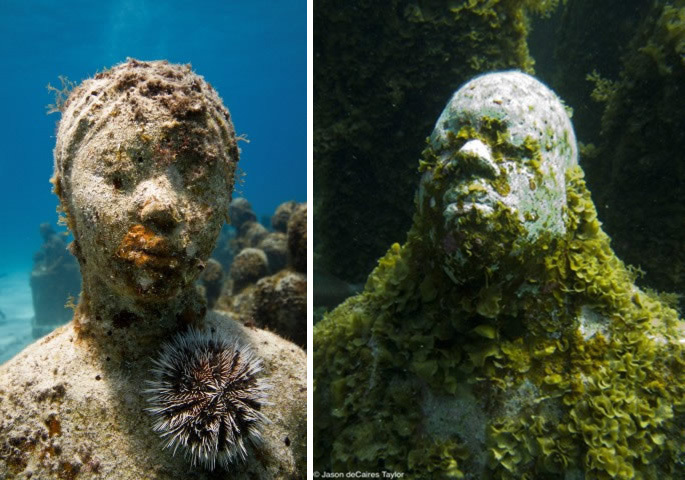 He's got more than 400 sculptures anchored into the sea bottom there. But suppose you're not the kind of person who gets wet. 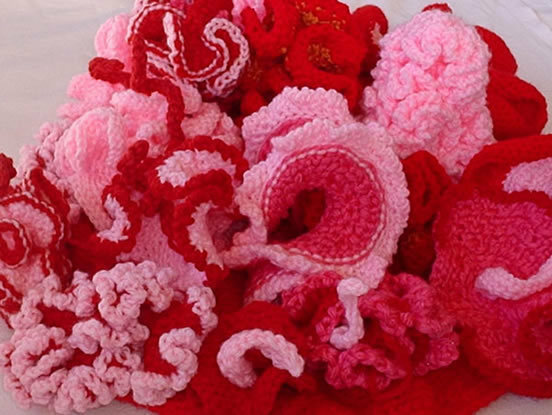 That's where the crochet folks kick in. 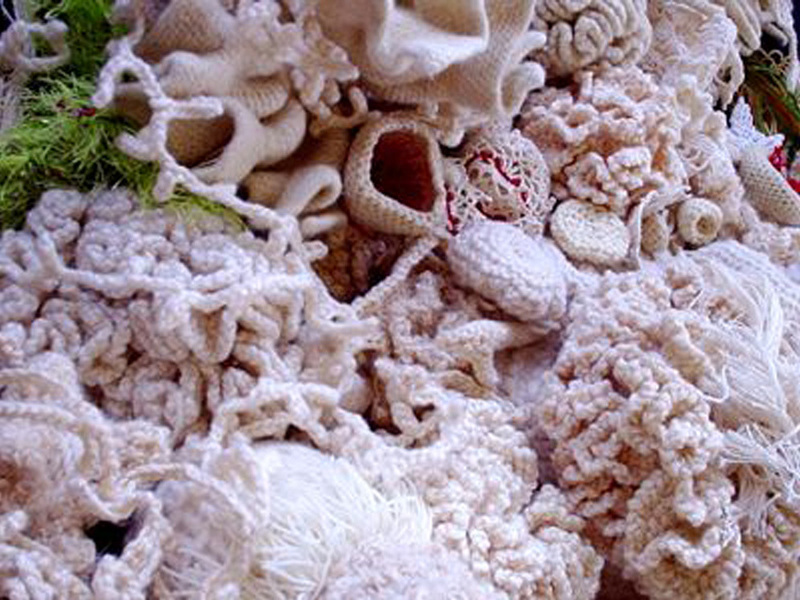 A couple of years ago, a group of weavers who call themselves the Institute for Figuring, (many of them have mathematical training and come from all over: Australia, Britain, America) decided to celebrate coral reefs their own way. 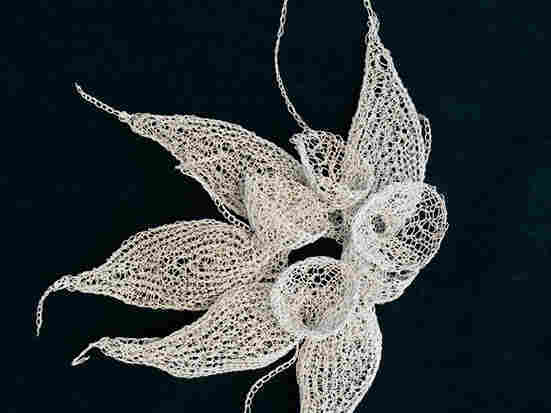 They created one-of-a-kind originals, knitting them into being. The effect (they had a show in New York City and later in London) was stunning. This one, for example, comes from an artist who calls herself "Dr. Axt." I don't know her real name; she prefers the pseudonym, but this feels like a coral reef gone wild. Her shapes are intricate, phantasmagoric and the idea is clear: what's being honored here are places where you can see these things — or things like them — for real. This next one, done in a very different mood, comes from Anita Bruce, a computer programmer who designs high-end business software in England. 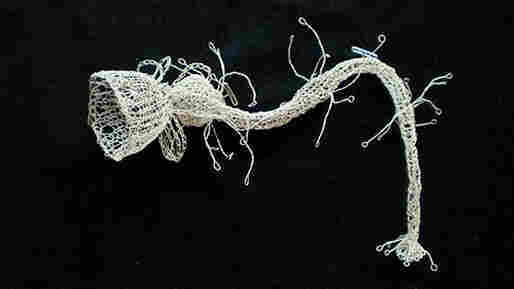 Her contributions to the reef show were medusa-like creatures made from what she calls "scientific wire." They seem like they're about to swim off. The two sisters who curated this show, Margaret and Christina Wertheim, both from California, say one day, back in 2005, Christine ever so casually said to her sister, you know, "We could crochet a coral reef," and Margaret, almost on a dare, put the idea up on their website, saying: "Anybody want to join in?" They were deluged. 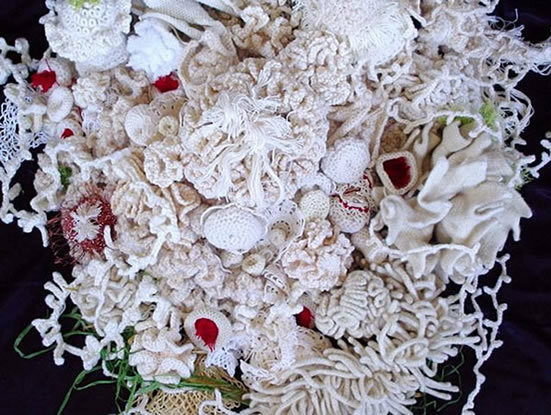 Reefy samples began arriving from all over, and so did an offer, right off the bat, from a museum in Pittsburgh, inviting the group to display its "reef" in a show. This was before they'd made anything. 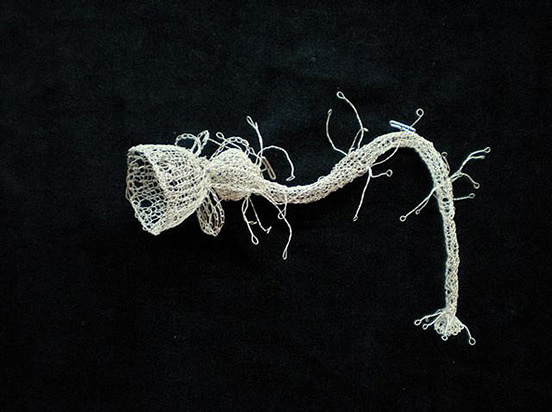 There is something in the air that wants to celebrate coral and while the scientists mull and the politicians deal, the artists right now are leading the way. 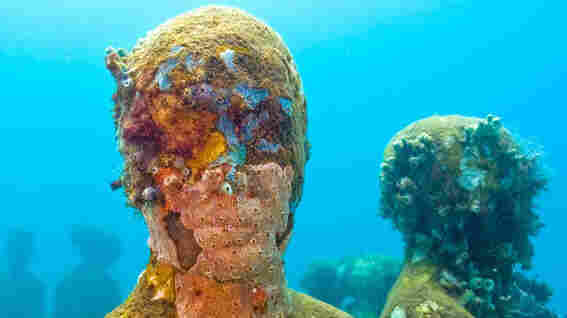 Asked by USA Today what he'll do next, Jason de Caires Taylor says he's going to keep creating underwater art. The coral, he says is his paint. "The fish supply the atmosphere. The water provides the mood. People ask when it's going to be finished." It isn't finished, he says, "This is just the beginning."